A while ago I had a spa retreat at Ritz Carlton in Toronto, and one of the services I had chosen was neck and back massage. It was really good and brought so much relief to stiff muscles due to my sitting at the computer desk almost all my adult life. I thought it would be great to have a massage therapy more often. While I already saw on the market some massaging chairs, they are fantastic, even my auntie has one, but I think they take much space to use them at home and they are quite expensive. Recently I had a chance to try SantaMedical Kneading Massager Cushion. It looks thin and lightweight (what I like) but it is also very powerful. This Kneading Massager Cushion is easy to set up, simply attach it to the chair at home or office using special elastic band. It can also be used in a car using special accessories included to the set. This device is designed based on shiatsu massage mechanism and provides a relaxing kneading massage whenever you need it thanks to its portability and weight. Kneading Massager Cushion can be used not only for your neck, shoulders and back muscles, but also on legs and hands. 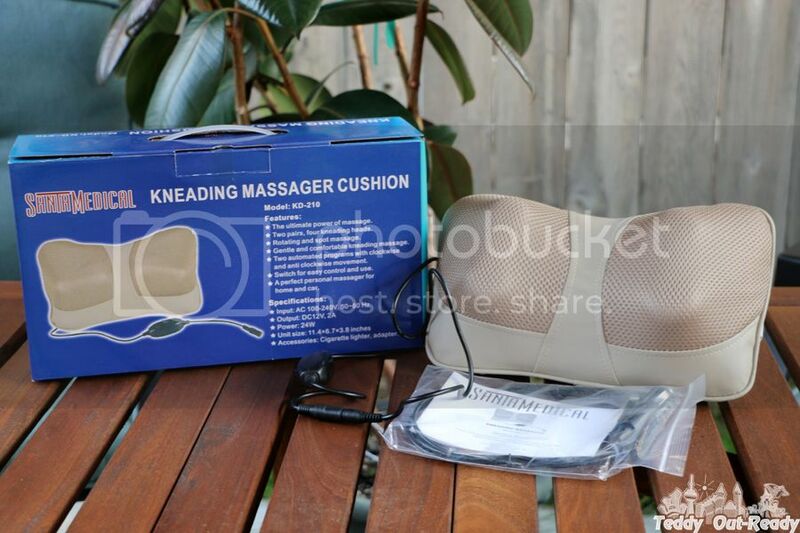 I use the Kneading Massager Cushion for my back and our grandfather like it to get a relaxing massage on his hands and abdomen, this massager is so versatile in usage. The SantaMedical Kneading Massager Cushion offers two modes: rotating and spot massage using two automated programs which you can switch to get clockwise and anti-clockwise movement. It delivers not only a quality massage but also saves you time because you can use it when watching TV, working at your desk, driving a car, talking over a phone etc. Overall, we like SantaMedical Kneading Massager Cushion a lot and recommend it to everyone, the price is very good, around $40 on Amazon , what makes a perfect gift almost to anyone who has tired muscles and needs a relaxing massage even from time to time.